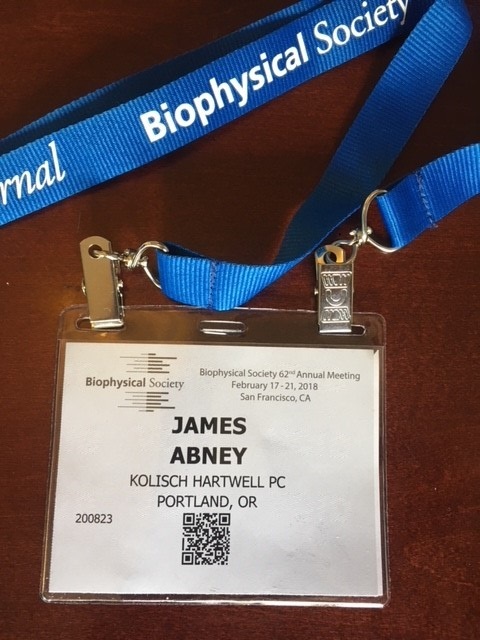 Kolisch Hartwell intellectual property attorney James Abney, Ph.D., joined nearly 6,500 attendees at the Biophysical Society’s 62nd Annual Meeting in San Francisco, California, on February 17-21. This meeting brings together leading scientists from around the world who work at the interface of the life, physical, and computational sciences. James attended talks, met with clients and with colleagues in academia, and reviewed the newest product offerings. Continuing scientific education is a top priority for James and helps him maintain the technical depth needed for many of Kolisch Hartwell’s legal matters. He also is currently co-authoring a new textbook on biomedical imaging, scheduled for release in 2019.